Some people go to church on Sunday mornings, but for others, Sunday is about a different tradition—Brunch! 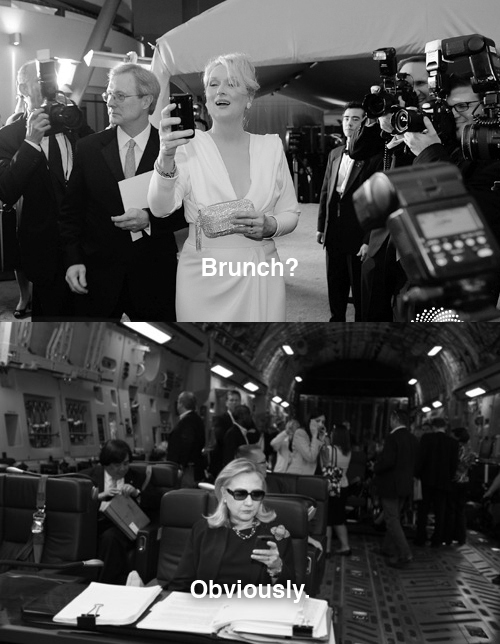 Brunch is one of the classiest meals of the week. Whether it is with family or friends it is always an event. Filled with tons of food and maybe even a mimosa (or two), so of course when coming to Seoul, it was necessary to find the best brunch restaurants the city has to offer. Unfortunately, brunch isn’t the cult like phenomenon that it is back home, so I had to do a bit of research to find a true brunch restaurant. If you are missing Egg’s Benny (or just eggs in general) this is the place to go! I had the flying pan breakfast which featured poached eggs on French bread with pesto with grilled mushrooms, potatoes, tomatoes, and hummus on the side. It was spectacular, and a lot of food. It was a bit pricey at 15,000 KRW, however, this is on par with most other brunch places and most other restaurants in Itaewon. My friend who ordered the Farmer’s Omelette was brought out a heaping omelette in a skillet topped with mushrooms. 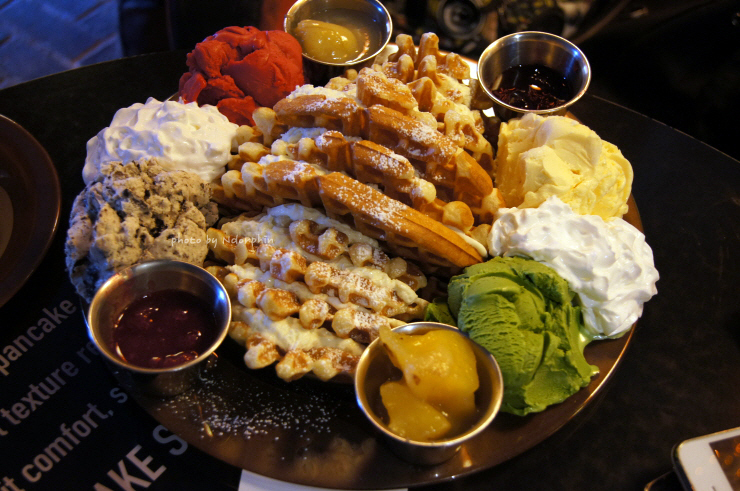 If I were to go to this restaurant again I would definitely want to try the pancakes, which come loaded with ice cream and toppings. They also had savoury pancakes made from rye, which would also be interesting to try. Here is a copy of their menu. This restaurant is a “must” for all you brunch fans out there. Directions: Take Subway Line 6 to Itaewon Station (Exit 2). Make a left on the first road. Continue for 30 meters to reach the restaurant on the right. If you are a pancake, waffle, or French toast fan this is the place for you! This restaurant this is the place for you! 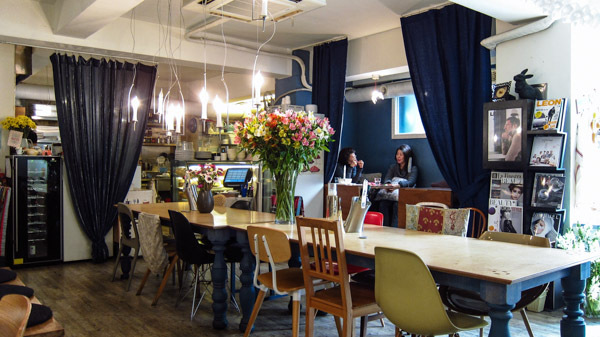 This restaurant is located in Gangnam and features a diner like décors. 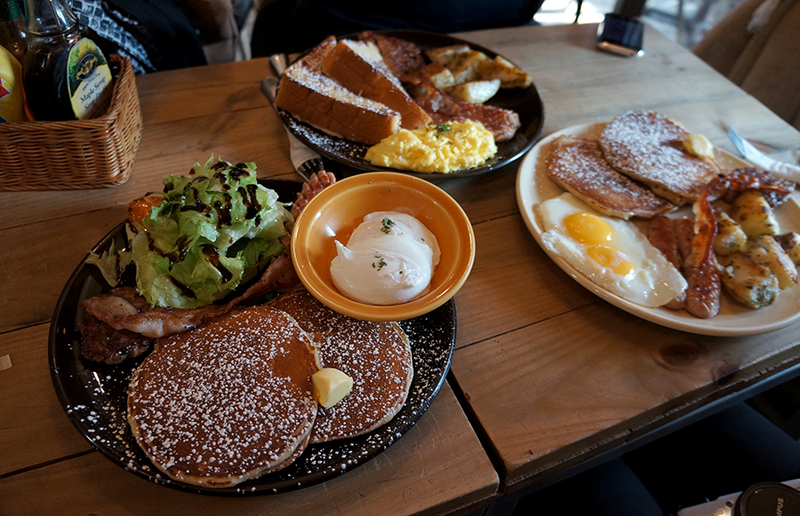 It offers all kinds of breakfast, not just pancakes, but if I were you I would definitely go for one of the huge stacks of pancakes, which come in a wide array of eclectic flavours. If you are feeling indecisive, there is always the “Split Decision Plate” comes with pancakes and brioche French toast, bacon, sausages, seasoned potatoes and two eggs done scrambled/sunny side-up/over-easy. 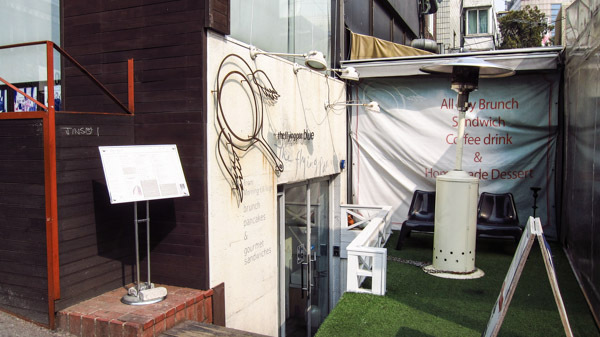 Like most brunch places this will set you back between 15,000 to 20,000 KRW. However, the portions are massive so I do suggest sharing with friends, giving you the option to try a few more things too. Directions: Take Exit 10 out of Gangnam station (Line 2) and walk straight till you see The Body Shop. Turn left into the lane right next to Body Shop and keep going straight for about 2 minutes. Butterfinger Pancakes will be on your left. This is a smaller, more intimate brunch spot that is also well known for it’s pancakes. 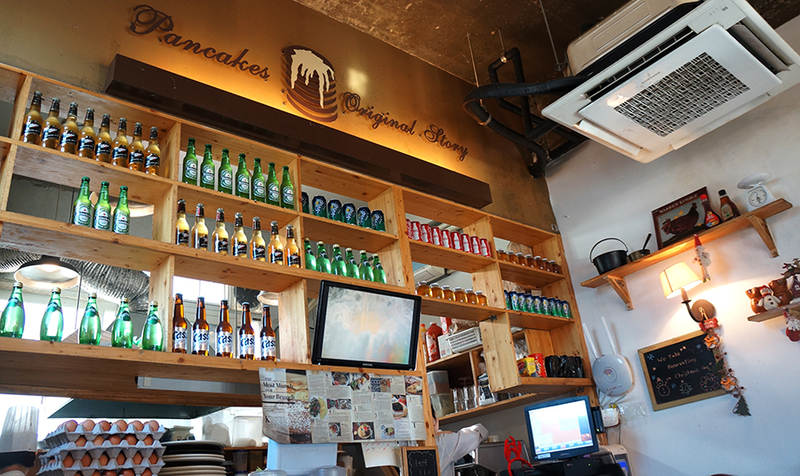 Their pancakes are said to be very fluffy and light, where other brunch spots in Seoul are more known for their denser pancakes. This restaurant does also all different types of breakfast, but due to it’s small interior it is a but harder to get into, but I definitely suggest trying it if you need your pancake fix. It is priced at the 15,000 KRW to 20,000 KRW range. Directions: Hannam Station, walk all the way straight out till you see the road, turn right and walk all the way (10mins) till you see a huge intersection, (you’ll be able to see the brown cafe exterior while waiting for the lights) wait for the lights and cross the road and it’s the first shop, in the corner. « Café Craze (part 4): Airplanes, Buses, and…Ddong?